Goatzz: Syzygy Farm - Goat product and service supplier located in Tucson, Arizona owned by Georgia Lowry. 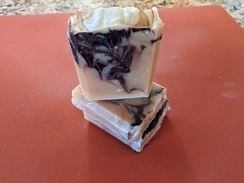 We started making goat milk soap in 2018 and it's been a lot of fun! At first, we gave it away to friends and family, but the ingredients are too expensive for us to continue giving away each bar if we want to keep making it. 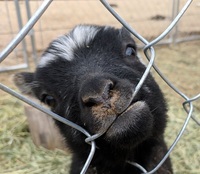 By buying our soap, you're funding future soapmaking endeavors and helping to support our goats and sheep. We have a variety of Shetland wool available in many colors and textures. Many of our sheep are fine-fleece (and registered with the Fine-Fleece Shetland Sheep Association to prove it! ), but for a coarser, more durable fleece we also have double-coated Shadow, who has beautiful light gray wool. Fleece is available raw or washed, and we hope to have roving and maybe even handspun yarn in the future. We shear in early spring, just before lambing. You can email us to reserve fleece from a sheep by name or by color. We'll let you know how the fleece turned out before you pay for it, in case there were shearing mishaps or for whatever reason that sheep produced inferior fleece that year. Any fleeces that aren't reserved will be posted on this store after shearing. Prices vary based on a number of factors, so if you're wondering why a certain fleece is priced a certain way, please don't hesitate to email us. For hygiene reasons, we can't accept returns on our soap products. If you have any issues with any of our products, please contact us by email.